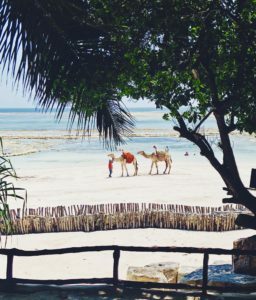 Diani Beach, Kenya: The Africa They Don’t Show On T.V. Travel More. Spend Less. Live Happy. 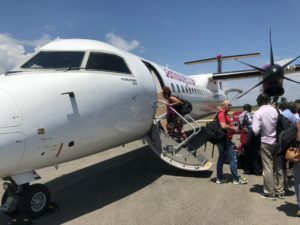 Recently, I had the opportunity to travel to Kenya. Every year around this time I travel to celebrate another year of life aka…my birthday. The trip idea came to me very randomly and once I begin my semi-manic behavior of researching Kenya and looking at pictures via Instagram, I knew I had to go ASAP. Lucky for me, there was a slight sale on the flights out of Charlotte so I knew it was a sign. 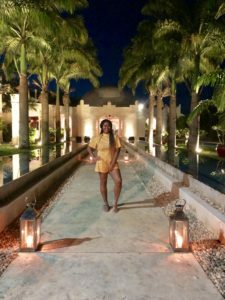 I decided to spend a few days in Nairobi and then spend the rest of the time out on the south coast of Kenya. When most people think of Kenya, they think of wild animals, dirt roads, people in huts, and The Lion King. 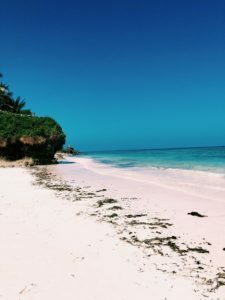 (Kenya was actually the inspiration for the movie) After doing my research, I knew that the East African country had so much more to offer and I wanted to see for myself. 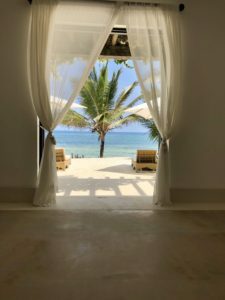 I booked my stay in Diani at the Swahili Beach Resort. I saw so many pictures and I knew I had to stay there. While it can be a little on the pricey side for a 3rd world country, it was worth it. 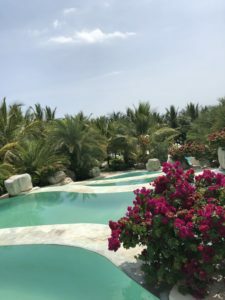 When I arrived onto the resort property, I was blown away. It was definitely a change from the hustle and bustle of busy Nairobi. The décor was a mix between African and Arabic with lots of earth tones and domed structures. 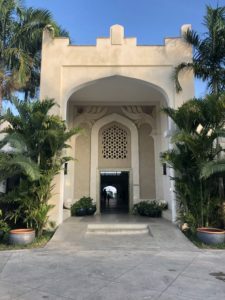 The staff greeted us and we were giving a refreshing welcome drink, which was a fancy ginger ale with honey.After getting checked-in, we were given a quick tour of the grounds and then led to our room. 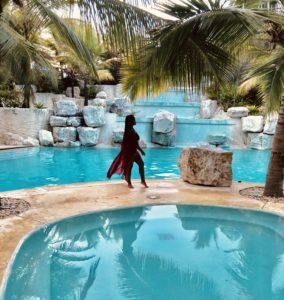 The resort had 9 pools that cascaded down a slope, one after the other like a never ending infinity pool. There were two formal restaurants, a casual restaurant, as well as a main dining hall. It also had a swim-up bar off of the main pool. The property had its own private beach. During low tide, it was a bit unusual because there were rocky paths that came out of the water, but this allowed you to literally walk out into the middle of the ocean and peak in to see the sea life. During high tide, the beautiful blue water of the Indian Ocean rolled in. On my second full day, my friend and I spent several hours at the spa on the property. The view from the spa was breathtaking. They offered a wide range of services including massages and facials. We both got 90 minute massages then spent just as much time taking in the view of the beach from the spa relaxation room. Outside of the gates of the property was a whole world filled with locals, tuk tuks, and motorbikes. It was very reminiscent of Southeast Asia. As soon as you crossed the line off of the property, you were met with locals trying to sell things or even get you to ride in their tuk tuks. The same went for going down on the beach too. It was a bit frustrating but understandable since that’s how locals make their living. For my “infamous birthday dinner” I reserved a table at the Ali Barbour cave restaurant. The restaurant has a free pickup service so we were picked up and dropped off for dinner. We were met by two men dressed in traditional Masaai garb. (The main tribe of Kenya) I would try to describe the restaurant’s interior but I would not be doing it justice. 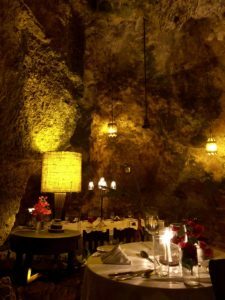 Just imagine eating dinner in a real cave complete with fancy tables and smooth tunes playing softly in the background. I ordered the chili crab entrée and my friend ordered the lobster. Seeing as though it was fresh seafood, the prices were not bad at all! As the night went on, every table in the place filled up. So it’s safe to say, it’s the hot spot of Dinai for a nice or romantic dinner off of your resort. I did not want to leave Diani. You would never know that Kenya would have something so beautiful to offer, but it does. Airline News: Is Basic Economy Really Basic? Up to date info, tips, and tricks sent straight to your email. Don't miss out!